Hello, world! 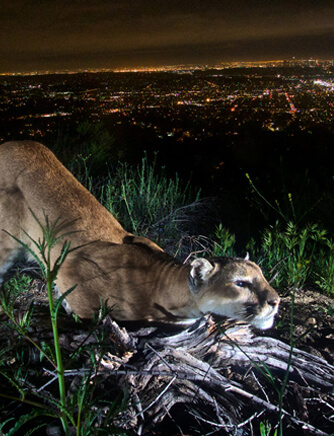 I’m P-22 the famous Hollywood mountain lion! You might recognize me from my media appearances – I’ve graced the pages of The LA Times and The New Yorker (just to name a few) – or from the my iconic photo in front of the Hollywood sign taken by super-famous photographer, Steve Winter. I grew up in the Santa Monica Mountains of West, but as I grew older, I kept seeing pictures of that #LA lifestyle from Griffith Park so I decided to see it for myself. I somehow hustled my way across two major freeways and now I have the whole place to myself. There’s tons of deer so I have a feast every week but there’s no ladies to join me and if I ever want a family of my own, my only option is to try and make it back across the interstates (which is a hard, no). My curiosity got the best of me back in 2014 when I was exposed to some rat poison. I wouldn’t recommend it, I looked pretty bad. It was a low point in my life but the humans in LA nursed me back to health. Still owe them a hug for that but for some reason, mountain lion hugs freak them out. Anyway, I want a family of my own and the #SaveLACougars campaign seems to be my only hope. I don’t want to be a downer, but my whole species could go extinct if the Wildlife Crossing isn’t built soon and it would be huge shame if our devilishly handsome tribe totally disappeared. I’m asking for help because us cougars really need it. 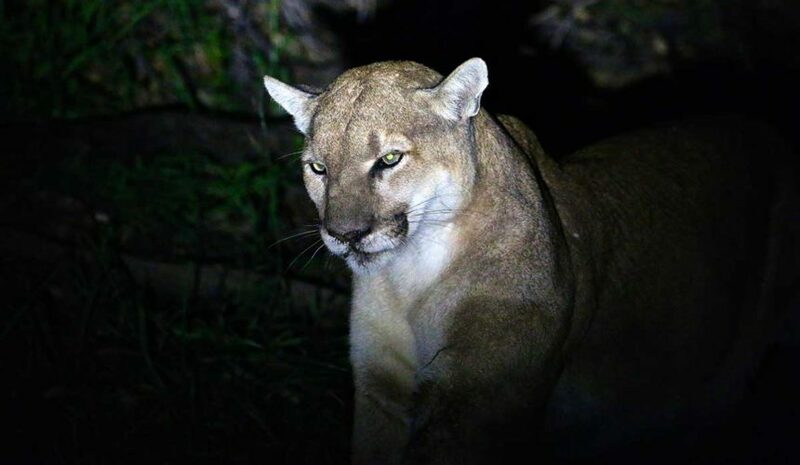 So, will you join the other humans and fight to save the LA cougars like me? 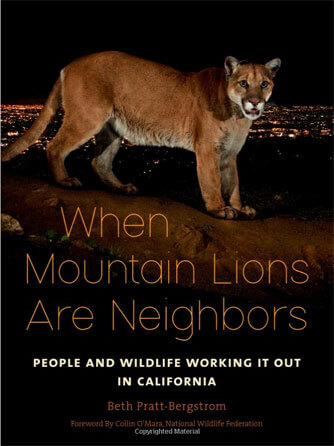 When Mountain Lions Are Neighbors tells the incredible story of P-22, a mountain lion living in the second largest city in the country. The book is also filled with other tales of wild wonder, including the journey of the wolf OR-7 and how Californians are welcoming wolves back to the state after a ninety-year absence, how park staff and millions of visitors rallied to keep Yosemite’s famed bears wild, and many more tales from across the state. Written by Beth Pratt-Bergstrom of the National Wildlife Federation, these inspiring stories celebrate a new paradigm for wildlife conservation: coexistence. That’s me at just 4 weeks! At about 2 weeks of age, I started walking, and when I reach about 8 weeks, my mom will lead me to a kill site so I can get my first taste of meat. Scientists think P-30 might be my dad – if that’s true, I’m the first documented proof of his fathering kittens. 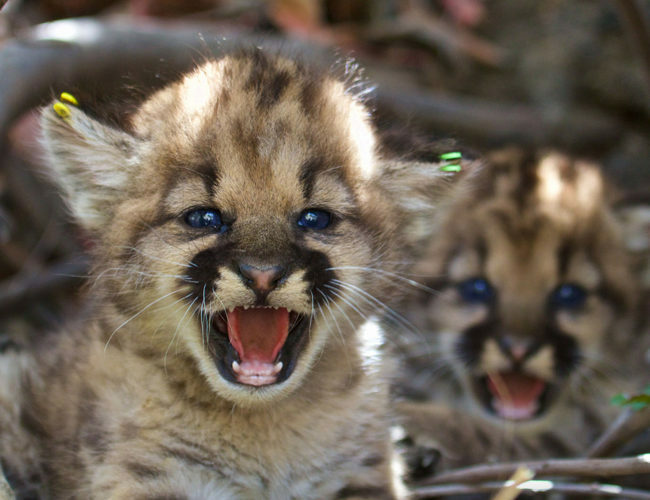 Since 2002, the National Park Service has studied over 50 mountain lions in and around Santa Monica Mountains National Recreation Area. Each one has their own unique story that has helped our researchers understand how these large carnivores survive in an increasingly fragmented and urbanized environment by evaluating their distribution, movement patterns, behavior, and survivorship.